With SBI’s line of pGreenFire1 Pathway Reporters, you can monitor signal transduction in real time. These vectors leverage our reliable lentivector technology and save you time—our pre-built signal transduction pathway reporters come as ready-to-package lentivector plasmid and ready-to-transduce pre-packaged lentivirus*. The pGreenFire1-TCF/LEF (EF1α-puro) Lentivector co-expresses a destabilized copepod GFP (dscGFP; 2-hour half-life) and luciferase from TCF/LEF transcriptional response elements (TREs) paired with a minimal CMV promoter (mCMV). The mCMV promoter alone delivers negligible expression, but when downstream of TCF/LEF-responsive transcriptional elements, drives expression of dscGFP and luciferase in response to TCF/LEF activity. The result is the ability to quantitatively measure TCF/LEF activity by fluorescence and luciferase activity. 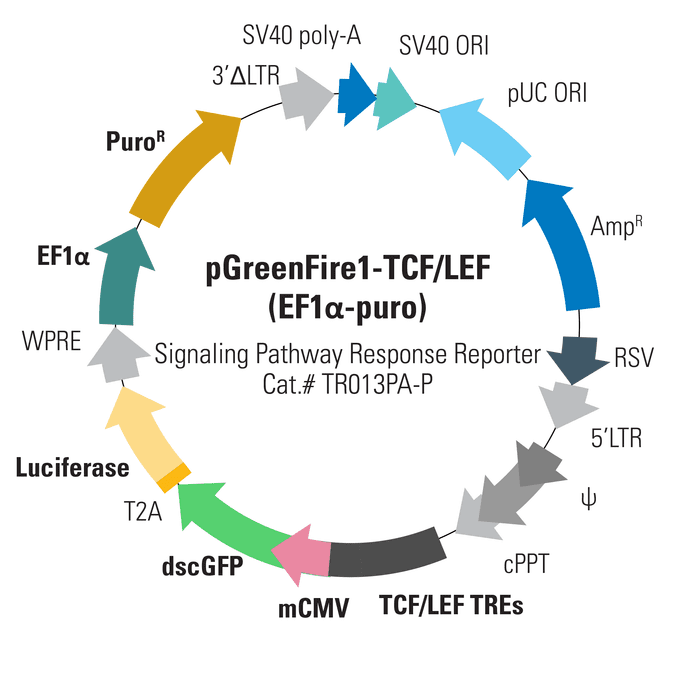 To facilitate cell line construction, the pGreenFire1-TCF/LEF (EF1α-puro) Lentivector comes with a constitutively-expressed puromycin marker from the EF1α promoter. Or you can choose a neomycin marker (EF1α-neo; Cat.# TR013PA-N) or no marker at all (Cat.# TR013PA-1). In addition, all forms of this vector are available as both lentivector plasmid, and pre-packaged virus.